But as they float along in the water, they discover that the real danger lies beneath. And it has teeth. Based on true events, Michael brings readers another harrowing tale of survival and suspense. 5 Things You Might Not Know About Sharks! …the story is enjoyable and reveals a tender theme about the power of the human spirit. 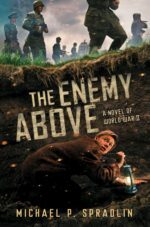 Patrick finds strength and courage from unusual sources and manages the impossible in order to save his brother and himself. This survival tale highlights one of the worst sea disasters of World War II: the sinking of the USS Indianapolis in 1945. It’s recounted by Patrick, a 12-year-old caring for his younger brother, mute ever since the two were evacuated without their parents from Manila in 1941. Desperate to find their parents, the siblings have stowed away on the Indy with the help of Benny, a tough-talking Marine with a heart of gold. When Benny shares his opinions and philosophies, his experiences and prejudices are on the surface. He has choice words for both Japanese troops and the U.S. Navy. But in the end, he is never too harsh a judge and instills in Patrick the Marine code: never leave a man behind. Benny will live and die fulfilling this promise to his charges. Descriptions of the explosions onboard are graphic; men are maimed and killed. Benny gets the brothers off the ship, where new trials begin. They float at sea for days on a soggy pallet; heatstroke, dehydration, and delirium set in; sharks circle. The carnage is gruesome. Given Benny’s essential kindness, it’s unfortunate that at one point, while prodding the boys, he tells them they are swimming like “pansies.” Extensive backmatter rounds out the incredible history. 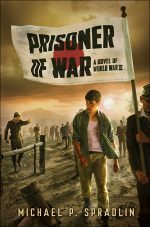 Readers ready for a strong dose of survival and war action will find this well-researched episode entirely gripping. 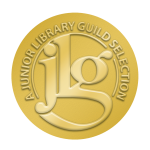 Into the Killing Seas has been named a Junior Library Guild Selection. I’m not sure how long I lay asleep half in and half out of the water. It could have been hours or minutes. When I came to, I was still clinging to the pallet and Teddy was whimpering softly, something he often did in his fitful sleep. The night sky was as dark as it had been when we abandoned ship, but it was growing lighter far off on the horizon. The moon cracked its way through the clouds and I could see Benny floating along, his burned hands twisted in between the wooden slats of our makeshift life raft. He groaned and muttered soft curses under his breath.